Editor’s Note: This is a guest post by Larry M. Silverberg, a professor of mechanical and aerospace engineering at NC State and director of the Namibia Wildlife Aerial Observatory Project. In our ongoing Research Matters series, NC State researchers address the value of science, technology, engineering and mathematics. In just a few decades, if current trends continue, the world’s majestic rhino, elephant, giraffe and other large African wildlife species will be extinct. African parks dedicated to wildlife conservation lack the resources to protect these animals from criminal syndicates that profit from poaching. I co-founded the Namibia Wildlife Aerial Observatory (WAO) Project to experiment with a new approach to address this problem: capitalizing on emerging aerial technologies that may not only protect these animals from extinction, but could transform African tourism. 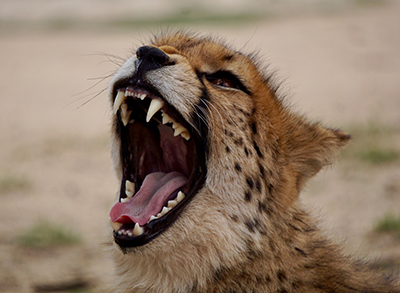 Cheetah on Naankuse Wildlife Sanctuary. Photo: Alli Schumacher. The relevant technologies can help provide security from poachers, but they can also assist African parks in other wildlife management efforts. For example, park rangers are already beginning to use aerial technologies to assess erosion damage to riverbeds, monitor controlled burns, keep an accurate census of park animals, and survey land. However, this technology may also have a long-term impact on tourism. Imagine that you are at home watching a soccer match on TV in the comfort of your living room – just like millions of other people around the world. At one time, you would have had to travel to the soccer arena to watch the match. So what does this have to do with wildlife tourism? Our goal is also to use WAOs to bring wildlife imagery from Africa to the world – instead of focusing solely on bringing tourists from other parts of the world to Africa. The contract arrangements that could bring African wildlife to a huge customer base makes good business sense – as is the case with televised sports. Someday these arrangements could provide African parks and their surrounding communities with the funds they need to protect these cherished species. In short, the Namibia WAO Project is a grand experiment. NC State students on the ground in Namibia. Photo: Alli Schumacher. 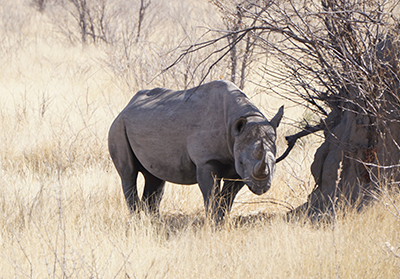 Namibia is a leader in African wildlife conservation. It is home to nearly all of the majestic animals at risk; it is safe and beautiful; and – as a benefit to our students – it is English-speaking. At the heart of the project are college students, NC State University, and three Namibian partners: Naankuse, a private wildlife sanctuary; the Namibia Ministry of Environment and Tourism, which manages the country’s national parks; and the Namibia University of Science and Technology. Much of the groundwork for the Namibia WAO Project is performed by field units of eight to 12 undergraduate students, predominantly engineering and wildlife majors, who spend a fall semester in Namibia as part of the study – abroad experience. Each field unit, under the on-site direction of a pair of trained graduate students, works on both a technical objective and a wildlife mission. For example, in the fall of 2017, our pilot year, a field unit of 10 undergraduate students studied the reactions of animal wildlife to unmanned aerial vehicles, or UAVs. (See the video above.) Different types of UAVs were flown at different altitudes to determine how best to fly over the animals without disturbing them. This information will inform how we deploy the WAO system. The students and instructors had an awesome time in 2017 and we are now opening the program to students and instructors from Europe and other countries. This will enhance cultural experiences and expedite the development of the technologies that span the WAO system. In coming years, the teams will assess such technologies as vertical takeoff and landing UAVs that fly longer and quieter while being compatible with autonomy. They will test autonomous battery exchange stations that effectively enable aerial vehicle systems to stay the air, and sensory suites that discern objects better. They will be testing out wireless networks that more efficiently stream data into the cloud, and will develop auto-patching and path planning algorithms that produce cinematic-quality video images of wild spaces. Rhino in Etosha National Park. Photo: Alli Schumacher. 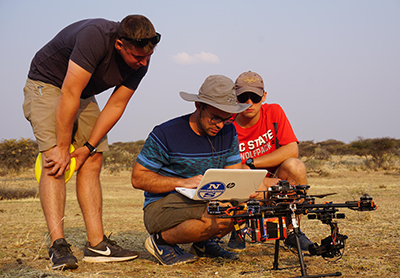 Directed by a faculty adviser, each team will experiment with different technologies while focusing on a research mission, such as the aerial study of animal behavioral responses, the assessment of UAV animal inventory methods, and evaluating the effectiveness of UAV field units in surveillance. The entire program revolves around the desire of students to tackle a global problem. However, it also gives them practical experience in solving on-the-ground problems, helps them make progress toward their degrees, and does all of these things without incurring significant costs. The study-abroad experience includes engineering and wildlife courses that fit into their undergraduate curricula, so as not to prolong graduation, and the study abroad costs are comparable to the costs of an on-campus semester (tuition + room + board). In addition, the student-to-instructor ratio of approximately 5-to-1 gives the students focused, day-to-day direction. The program appeals to the on-site graduate student instructors, too. They receive advanced training, work on a research project that contributes to their graduate degree (the field unit’s technology objective or its research mission), and receive a stipend that covers their expenses. In short, the Namibia WAO Project exemplifies the best aspects of the research community as a whole, of NC State’s research community in particular, and the power of our students. It shows how global partners can come together and help solve an important, real-world problem. If you are a student interested in participating in The Namibia WAO Project, contact Dr. Larry M. Silverberg at lmsilver@ncsu.edu.